Recycling bins were set alight outside a South Yorkshire supermarket in the early hours of this morning. The bins were found burning outside Tesco in Undergate Road, Dinnington, at 1.45am. Last night they were called out to a moped torched in Deerlands Avenue, Parson Cross, Sheffield and a wheelie bin set alight in Yews Lane, Kendray, Barnsley. Yesterday morning a scooter was set on fire in Doncaster Road Dalton, Rotherham; a Peugeot 206 was fired in Adrian Crescent, Parson Cross, Sheffield and a caravan was torched in Abbes Walk, Burghwallis, Doncaster. That afternoon a BMW was set on fire in Blythe Street, Wombwell, Barnsley. In the early hours of Saturday a fire was started under a bin chute at the Adamfield tower, Brightmore Drive, Batemoor, Sheffield. 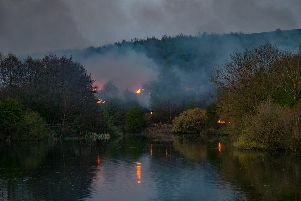 Anyone with information on those responsible for any of the arson attacks should call South Yorkshire Police on 101.